Would you like to optimize cash deposit and bill payment transactions this 2019? 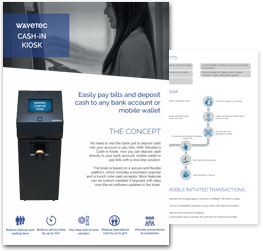 Download our Cash-in Kiosk brochure to find out how Wavetec’s innovative hardware and software solutions can help you reform delivery of key banking services and enhance customer experience. Wavetec’s turnkey banking solutions are completely customizable and can be easily integrated into your network. How Cash-in Kiosk improves customer experience? How to increase banking coverage with Cash-in Kiosk? How operational cost is reduced with Cash-in Kiosk? Download our Cash-in Kiosk brochure to optimize banking services and customer experience.